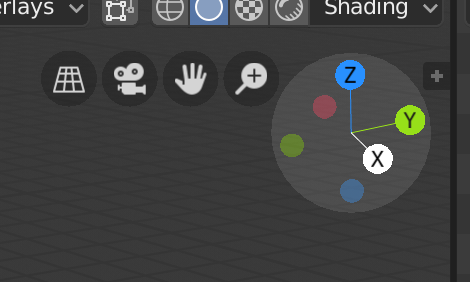 In Blender 2.5 we added these + buttons in the corners on the viewport to open the toolbar and sidebar. However, these are often in the way, and means we can't put the viewport gizmos in the corners. In the Text Editor, it overlaps with the text, which isn't very nice. These can be shown half the current width with an arrow instead of a plus icon. William Reynish (billreynish) renamed this task from Remove + buttons to open Toolbar & Sidebar in the Viewport to Remove + buttons to open Toolbar & Sidebar in the Viewport & Text Editor. Some editors don't show this - timeline, graph editor (more TODO's then blockers). Currently headers and properties tabs have no menu access to add it back. It's unclear if this design proposed to remove all or only some of these widgets, we could remove all, then make sure there are ways to add them back, however this is likely to be less discoverable - eg: Someone might might a header by accident, then not know to RMB over a blank area to toggle it back on. The down side to removing only some of these is we have inconsistent ways to access regions. Too many open topics - marking as incomplete. If you hide by resizing, it's not obvious you need to enable them via the menu. Other applications don't support this, there is normally a minimum width, hide show is done only via the menus or key bindings. Suggest if we remove these UI elements we also don't support resize-to-hide. It can be hidden by default. And when you move the mouse to the right or left side of the window then show "+". And it is better to change the icon for the Sidebar because it is on the right side. In the Text Editor. When Header is hide then the "+" button is poorly visible. It is necessary to add padding on top as on the left. It may be better not to remove the "+" button but replace to the arrow and make smaller. It seems inconsistent to show this button in some situations and not others. And I don't think we should ignore the fact that hiding something with no visual way to restore it - is weak (I've seen new users do this before with headers, in 2.4x when there was no '+' icon). As @Grigoriy Titaev (gtitaev) suggests, we could just show this button ~half the current width, with a small triangle arrow. This would be a small change and make them less intrusive. I'd like to take this on as a first project. Can I assign myself to it?